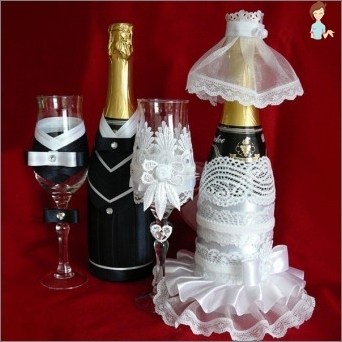 How to decorate your own wedding champagne and glasses with decoupage, beads, ribbons? 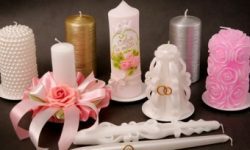 Home / Needlework / Wedding champagne and glasses: how to decorate your own hands? 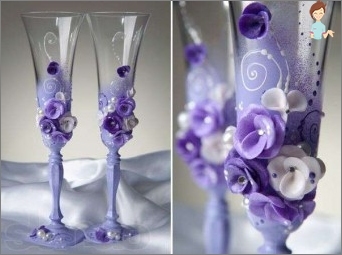 Wedding champagne and glasses: how to decorate with your own hands? The decoration of champagne has been used for a long time. This drink is one of the main attributes of the celebration, so all couples seek to decorate the bottle with various elements. Any wedding attribute deserves specialAttention. Bottles of champagne, glasses, from which the newlyweds will drink, are one of the main objects of entourage. They are decorated using a variety of elements. 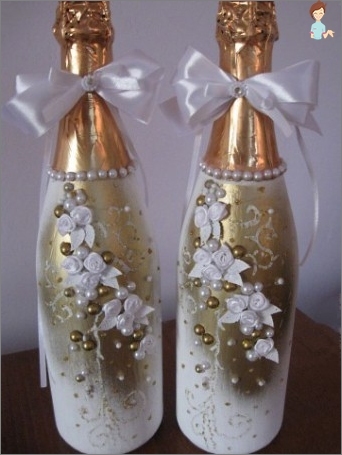 By tradition, wedding champagne is decorated as a bride and groom. On the bottles wear analogues of holiday dresses and accessories. They sew, draw, sometimes make appliques. Nowadays often on vessels with a drinkStick photos of the newlyweds with their autographs, names, date of the wedding. If you want all the attributes to look original, you can use other decoration techniques. Fantasy and your own hands will help you makeThe most exquisite entourage. To make more creative decisions, it is worth familiarizing yourself with already existing ideas that can lead to interesting thoughts. If this cloth is present in the attire of the bride or groom, this way of decorating will be very appropriate. Instead of sewing orders for bottles they can be made with satin ribbons. Just in case, take more of the necessary elements - suddenly, during work, something will go wrong. First of all, we remove stickers from the vessels, butLeave the foil on the neck. Immerse the wedding bottles of champagne in the water for about an hour, and then gently remove the labels and wipe the glass to make it absolutely clean. Try on the lace, from which you will make "collarFor the neck, overlapping obliquely. Carefully cut off excess tissue, and apply the necessary part with glue-pencil. Then proceed to one of the most critical stages - the production of "Wedding dress"From the tape. To do this, parallel to the collar we apply it to the neck and cut off such a piece, which is needed in order to make one full turn around the top of the bottle. It should fall on the bottom of the "Collar", But do not close it. In the same way, we attach the remaining turns, which will begin in the middle of the previous one. From these elements we will make wedding champagne "dress"With their own hands, but that it is good"Sat», The base (glass and the bottom of each layer) is greased with glue. "Dressing up"About 2/3 of the bottle, continue to wind it up to the very bottom, but already in a straight line, not diagonally. Then from the wide bow we perform the skirt. If you have to cut edges for this, they need to be sewn neatly, but it can look rough, untidy. Therefore, it is better to use a soldering iron and use it to connect the edges. The hem can be processed by gentle embroidery. Now the bow must be gathered with a thread toHe took the form of a skirt. We prepare 2 more of the same elements. One of them (which will be the top one) is joined by a brocade tape. The latter will serve as a decor for skirts, as well as hide the place of their assembly. Ornaments can also be glued, but first try on them to be at the right level. To keep the skirts well, you can also "Seize"Their thread, but it is important to take into account that it should be in the tone of a golden"Band"Oborok. Of course, the decollete zone of the "bride" should be decorated, so we also decorate the neck of the bottle, glued to "Collar»Rhinestones in the form of a necklace. Now we need to decorate the vessel with a hat. It can be built from cardboard and pieces of satin. Cut out a circle with darts in the form "Rays"And a rectangle about 1 cm wide,Length equal to the length of the circumference of the neck of the bottle. Rectangle to glue to get a cylinder, and connect it with a circle, bending inside darts, which will allow you to connect the two parts. We cut out one more circle from the cardboard with "Rays", But they must be inside. From it we will make the fields of the hat, gluing the cylinder with the help of darts. 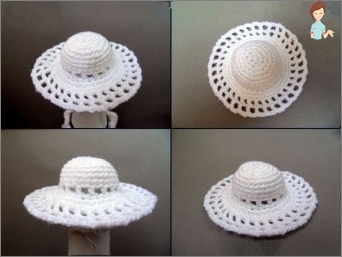 Now the hat needs to be pasted with satin and decorated with a bow from the same material. 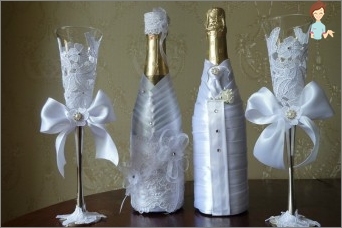 Here's how you can decorate wedding champagne in the style of "bride"With their own hands. «The groom"You can dress the same way, but he does not need a skirt, necklace, instead of which he will have a butterfly. "Collar"We make strict - interlacing the white satin ribbons obliquely. Next, we make the costume with the same weave, but with black satin ribbons. From large crystals you can make buttons on a suit. Decoupage of wedding bottles Champagne for the newlyweds with their own hands Begin with the cleaning of the vessels from the labels. We do this with water and a knife. Next, alcohol, degrease the glass, apply to it two layers of white acrylic. Postcards from both sides are covered with acrylic lacquer, we dip them for half an hour in warm water, after which the paper base from them easily leaves, and we will have transparent pictures at our disposal. Cut out the parts they need to create a composition. PVA diluted with water and using a mixture of glue fragments of postcards. End decoupage should smooth out the gaps between the pictures and the glass. This is done by means of a sponge and paint, which is the most suitable for the color for a certain image. More interesting will be the composition, if you addIts any volume elements (beads, stones, rhinestones, molding, etc.). The vessel can be opened with a varnish, giving it a shine. If the picture turned out to be elegant in the style of minimalism, you can add a little shine, which is a bit "Will revitalize" her. One of the best ideas for a wedding decoupageA vessel with champagne and glasses, which you can do by yourself - the realization of the idea of ​​the wedding itself. Choose cards with pictures of rings, bride and groom, pigeons, etc. This technique of decorating the vessels with their own hands, too, involves cleaning the glass from the label. Next, we put on it an aerosol, let it dry for 2 hours. Mark the pattern on the bottles - one at a timeHalf of the heart on each (in a mirror image), soak the place with glue. Using tweezers, apply all the elements to the vessels, alternating them in the order that you like. Around the decoration, you can make some other non-bulk solid patterns. It's better if it's just small emptiness on a general background. Great idea for decorating vessels with champagne. Choose a gentle pattern, performed by a crochet of thin threads, tie your own hands with canvases, narrowed upward in the shape of the neck. 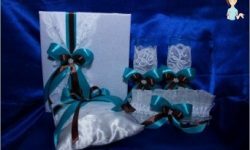 You can complete the decor with rhinestones, stones, beads, ribbons, but do not overdo it - the knitted pattern itself looks very elegant and bright. The easiest way to decorate them is by tapping silk or satin ribbons. Often the decor of glasses "Consonant"With the style of design of vessels with champagne, so you can choose for yourself any technique described above. If there is a desire to single out them, you can applyother methods. 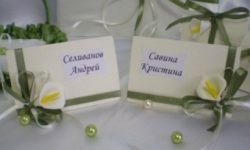 For example, you can put rings, pigeons, honeymoon silhouettes, names or initials of the bride and groom with crystals or beads, fixing the materials with glue. Elegantly look glasses, decorated with tulle, lace, organza, veil. In the wedding decor, flowers are never superfluous. They can be natural or artificial, painted, engraved or voluminous (for example, fashioned). As for engraving, with her help, too, you can apply the initials of the young, the date of the wedding, etc. Very well it combines with the painting. For originality, you can combine different ideas and styles, but remember that the attributes should not look too pretentious. Otherwise, they may look vulgar, tasteless.